KUALA LUMPUR (Apr 29): Last year, CIMB Group Holdings Bhd's consumer banking segment overtook its traditionally strong investment banking segment for the first time in terms of contribution to the group's earnings. In the financial year ended Dec 31, 2016, consumer banking contributed RM2.27 billion or 46.4% to CIMB’s profit before tax while wholesale banking accounted for RM1.96 billion or 40.1%. Revenue came in at RM16.05 billion, up 4% from the previous year, while net profit improved to RM3.56 billion from RM2.85 billion before. One may think this is a natural rise in the consumer banking segment for the group, what with tepid deal flow amid a less-than-conducive-to-deal-making economic climate, which led to the smaller contribution from the fee income business. But growing consumer banking income contribution is actually one of CIMB's Target 18 (T18) goals, outlined in February 2015, wrote The Edge Malaysia senior editor Joyce Goh and senior writer Esther Lee in the publication's cover for the week of May 1-May 5. Under T18, the group wants to achieve a return on equity (ROE) of 15%, common equity tier 1 ratio of over 11%, cost-to-income ratio of less than 50%, and consumer banking income contribution -- including contribution from commercial banking -- of 60% by end-2018. CIMB group CEO Tengku Datuk Seri Zafrul Aziz told the weekly the bank is learning to engage with markets it never focused on before. “We want to go back to our natural market share. In Malaysia, we should be top two [in the small and medium enterprise market] but we’re not [now]. We’ve been conservative in our engagement with the SMEs; we’ve been very corporate. Even in consumer banking, we’ve always been ‘preferred’ rather than ‘mass’. These are the markets that we need to tap into and where you will see growth as we start engaging with them,” he said. He said the consumer banking business, which has huge potential, has done "very well" for the group because of its smaller scale compared with wholesale banking -- which includes investment banking, corporate banking and treasury and markets. "It was simple for consumer banking. We grew the fastest in mortgages, personal financing and credit cards in Malaysia because we were better in our data analytics and mining, which enabled us to better target customers that needed those products," said Zafrul. Notwithstanding that, Zafrul said CIMB has not sidelined wholesale banking as it moves forward to achieve its consumer banking income contribution target. “We’ve always told our staff that we cannot drop off the league table,” said Zafrul. With the 14th general election on the horizon and anticipation of a better economic year ahead, analysts believe things will pick up in CIMB's wholesaling this year, what more with last year's low base effect. UOB Kay Hian Research, for one, has projected an 8% year-on-year growth in fee income for CIMB this year, after noting that brokerage and underwriting charges were the drivers of the banking group's fee income growth during the 2013 general election. 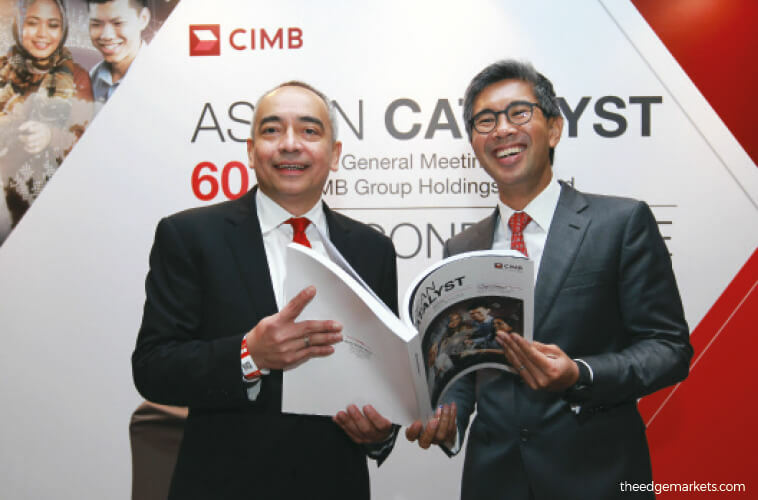 CIMB chairman Datuk Seri Nazir Razak himself, wrote The Edge Malaysia writer Billy Toh, also remarked yesterday that interest in investment banking has returned, partly driven by leadership changes in some organisations like Permodalan Nasional Bhd. "These new leaders are looking at new ways to create value and you’ve seen some deals announced. I think even in other areas, there is a sense that people have been too docile in terms of deals. Deals can be done to reduce costs and synergise for more revenue. I certainly feel from the marketplace that there is a lot of interest again to approach investment bankers,” Nazir said. While consumer banking is looking on track to its T18 target, how close is the bank to meeting all its other targets by end-2018? Certainly, it has achieved its common equity tier 1 ratio goal, which stood at 11.3% as at FY2016. As for its its cost-to-income ratio, which was 59% in 2015, it is now down to 53.9%, not far from its 50% target. But what about ROE, which stood at 8.3% as at FY2016, short of its 10% target for the year due to impairments? Is the 15% mark still achievable? Pick up a copy of The Edge Malaysia today to find out more on that, and why the bank has chosen 'Forward' as its new tagline.